Well better late than never! 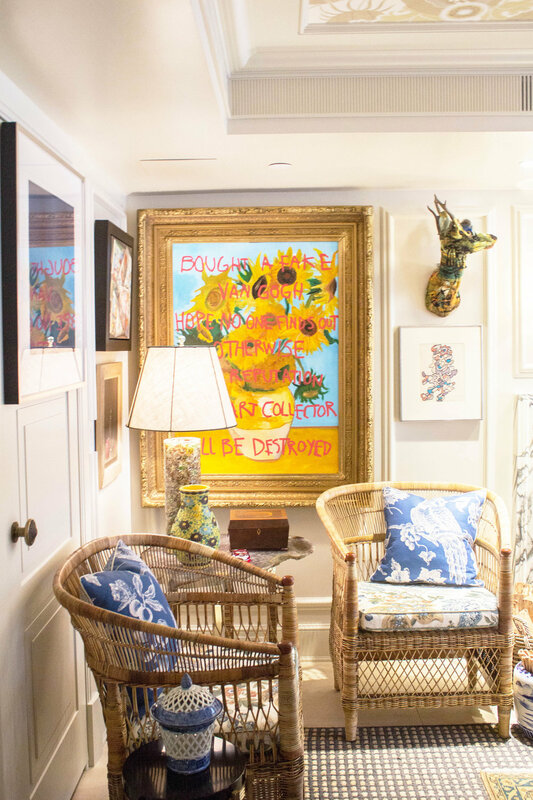 I've been wanting to share my Kips Bay Show House tour with you since forever, but have been side tracked with my full-time job-- what a pesky little nuisance it's been (not the helping people part, the amount of time it takes from my day part). Thankfully I'm planning to go part-time in the fall, and should have more opportunities to do things for Trulery, like keep up with the blog, see consulting clients, teach, and do research on dress and emotional functioning. I'm really excited about getting the chance to do different things so I'll keep you posted. But back to the Kips Bay! This year I went back with my friend Maribel fully expecting to see fun, quirky, and chic designs I can steal. I brought my camera this time, but of course neglected to take my wide angle lens, making it kind of difficult to capture full rooms or wider spaces. So instead of featuring full rooms, I've captured favorite aspects of rooms I really like-- which is what I'm usually drawn to anyway when I go to show houses. I look forward to taking bits and pieces of rooms I can store and use in my own space. 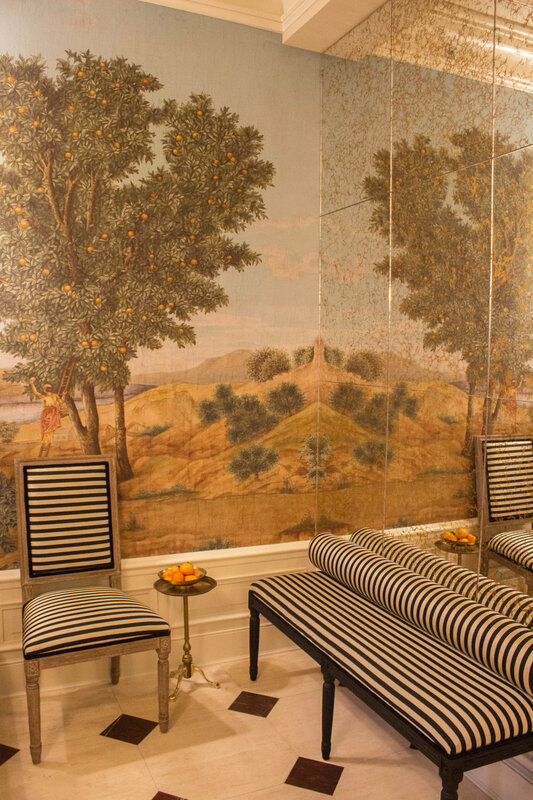 This year's show house was beautiful-- a 19th century Upper East side mansion originally designed by August Hatfield in the neo-Grec style (think stately Brooklyn brownstones with simple lines and incised, carved ornamentation). This year there were lots of lady-like spaces with Chineoiserie, mixed in with edgy, alluring, and colorful interiors. Here are some of the spaces that caught my eye. 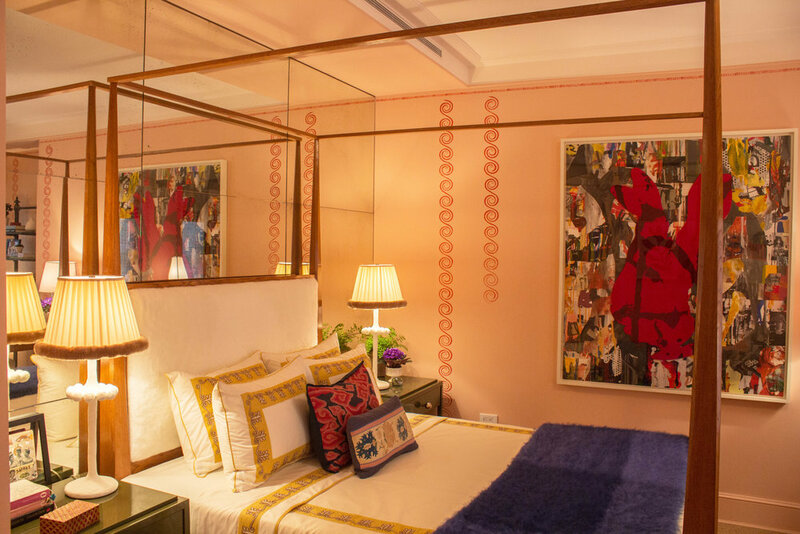 This room, simply entitled "Bedroom" was designed by Katie Ridder. It feels sweet and inviting with it's bohemian mix of prints, textures and styles. I really appreciated the stenciling on the walls. It didn't feel hokey, and was a crafty way to add visual interest to the top part of the room, which kept it from being too bottom heavy. Here is the other side Ridder's room. It's modern, fancy, and proper with the mirrored wall making the space feel more expansive and dramatic. The abstract, modern artwork ties in all the colors nicely. There was a lot going on in this room and I found it quiet enjoyable (I'm kind of a maximalist although I try not to be). 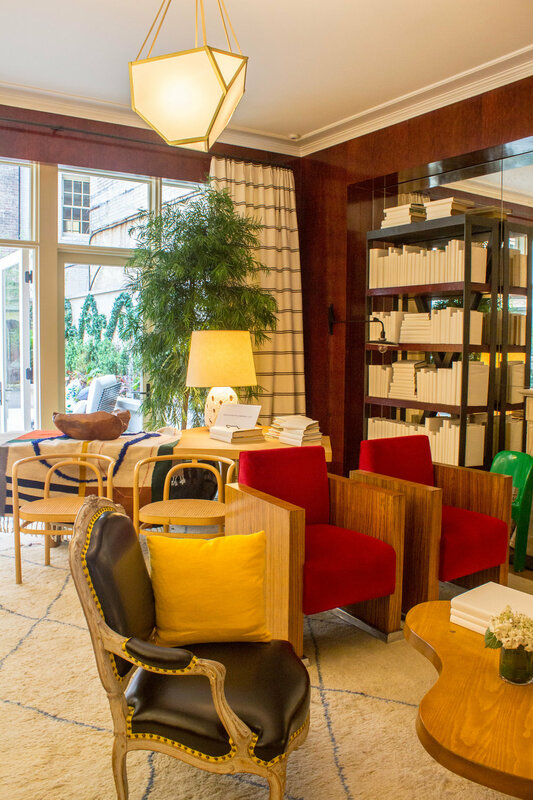 This room, "Cherry Bitters", designed by David Netto, has a mix of modern, mid-century, and ornate furnishings with white wrapped books for a strong architectural statement. I'm not exactly sure what the name Cherry Bitters is referring to but the cherry wood walls make the white and bits of color stand out for an overall modern statement. 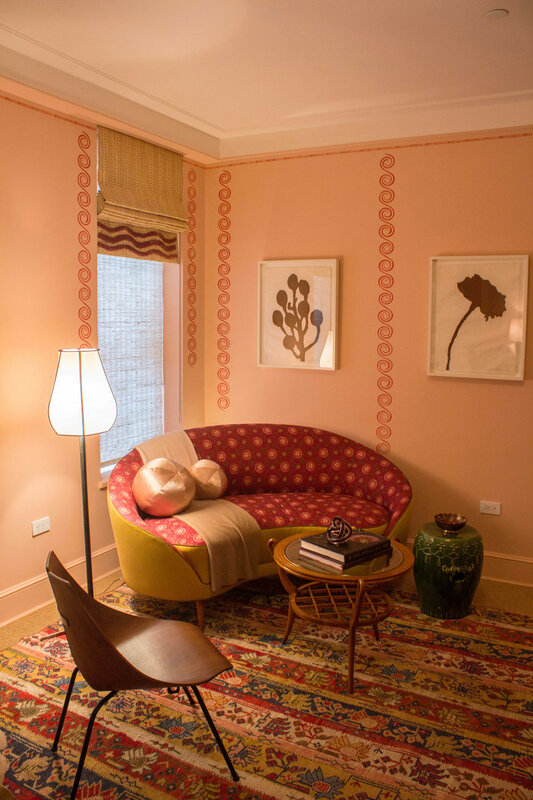 This little corner of Phillip Mitchell's room, "Drawing Room", was just one of the cozy nooks in this room. The elaborate picture frame with the cheeky picture, the rattan with floral printed cushions, the wall of art, and the moldings all create a space that feels both upscale and relaxed at the same time. Designer, Brian Del Toro calls this "Laura's Room." And I don't know who Laura is but I can imagine Laura living here. 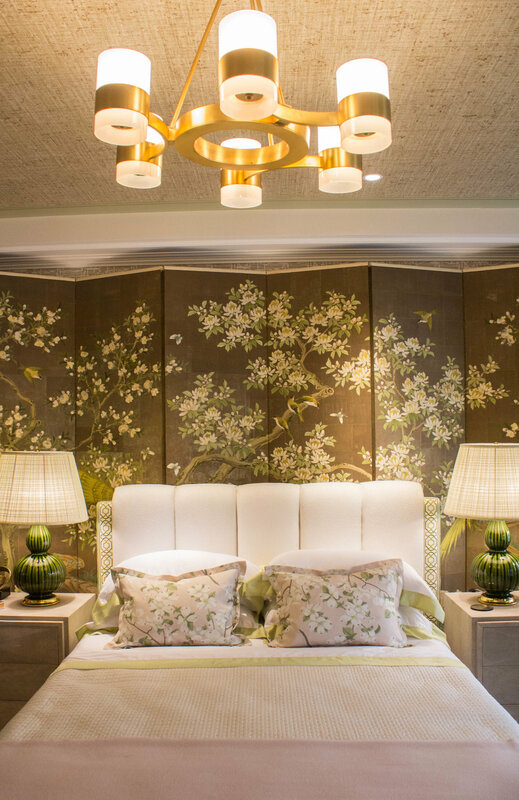 This traditional Chinoiserie room with it's recognizable bird, floral motif is offset with modern, graphic lines like the scalloped tufting of the headboard, angular side table, and boldly shaped chandelier. All the pretty extends to the other side of Del Toro's room. This must be where Laura gets gussied up for her date with... Tod (?). "Olympia Folly" is the name of this room designed by Alexa Hampton, and it pretty much describes the essence of the room. The room draws from the classical period (think Greek and Rome architecture during BC or the early centuries) and brings it into the 21st century. I like the pairing of orange and red, and the mural wall covering. 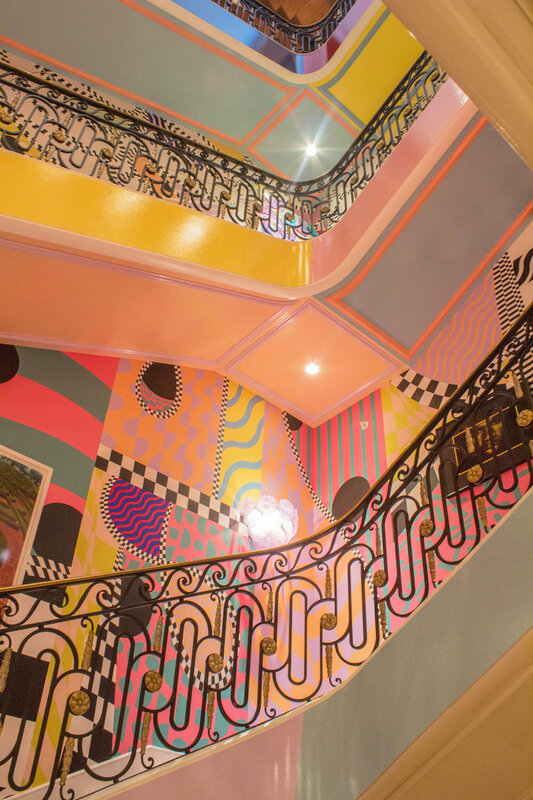 Sasha Bikoff's "Stairway to Heaven" hallway was a showstopper. I'm only sorry I didn't have my wide angle lens to capture it more fully for you. But as you can see it's a smorgasbord for the senses. She incorporated black and white artwork of hip hop artists on the walls giving it an edgy, party-like-a-rock star feel. I dig these chairs, and together with the waterfall mirror, they capture the ultra modern, fantasy vibe of the hallway. 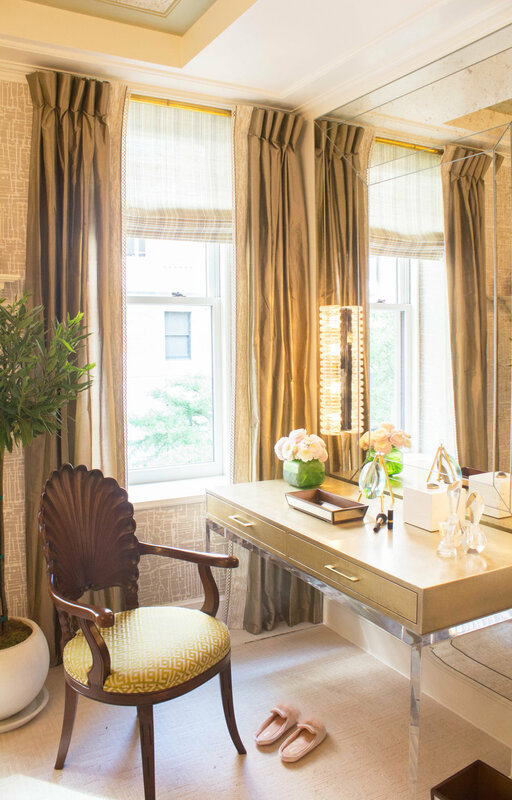 I really loved this "Look of the Day" dressing room by Marcia Tucker. The muted colors, cushy padded walls, feminine details, clean lines, and bold lighting did it for me. Just goes to show a chic dressing room doesn't have to be decked out with glitzy, glammy furnishings and stand out colors. This rainbow ceiling in Barbara Ostrom's "Art and Ala Carte" room is so ooh-aah, and pleasantly unexpected in this grand, first lady style space. This is the entryway to the show house, and I loved the mural against the black and white fabric. I actually planned to put a black and white forest motif mural in my dining room, but after seeing this colored one, it's changed my mind about colored murals. What part of the show house do you like the most? Here, I wrote about how to deal with difficult personality types. I enjoy making psychological concepts relatable to lay people. It really is a different, and refreshing style of writing considering that most psychology articles are written for esoteric journals and often complicated by psychological jargon. I based the difficult personality types on actual clinical personality disorders (histrionic, narcissistic, depressive, compulsive, dependent), but stayed away from discussing full blown personality disorders as I felt it was beyond the scope of the article. I wanted to strike a balance between being entertaining and informative; providing psychoeducation and introducing the readers to different types of people without getting too clinical, especially since most of that information can be found on other, well-known websites. Read the full article here. I was really psyched to write about design psychology, a branch of psychology that focuses on meaningful and emotionally fulfilling design. It's a relatively new field and looks beyond focusing on the aesthetics or safety needs of a space to social and psychological needs that push us to achieve a self-actualized sense of place. I incorporated some tools used in design psychology to helps clients create a "blueprint" of their ideal space, including creating a vision of an ideal space based upon past, present, and future sense of place, picking favorite objects that evoke meaningful memories, and getting rid of objects that do not have meaning. See the full article here. For this piece I wanted to target over shopping and ways to cope with it. Over shopping is similar to other types of addictions in that you use a "thing" to avoid dealing with deeper level issues that are often harder to address directly. So as an alternative to faulty coping skills, I offered some tips for dealing with poor shopping habits such as figuring out the reason you over shop, what you're getting from it, and learning to use other, healthier ways of coping. You can read more about the article here. For sure writing can be challenging, particularly with my hectic schedule. But it is also super rewarding to have an opportunity to be creative. In addition to the The Everygirl, I have also recently been hired as a contributing writer for Houzz.com. I'm thrilled to be able to photograph and write about people's homes for the My Houzz series. I have a passion for interiors, and writing for Houzz is icing on the cake. So stay tuned for posts about my home tours! Until next time folks. I love bohemian style. I think it's because I enjoy all different styles: the clean lines of modern décor, the cool classics of midcentury furniture, a little Hollywood glamour, and a good dose of romantic furnishings, the kind that feels proper, but not too precious. And bohemian décor has all that and more. So when I heard that Justina Blakeney was coming out with a new book on bohemian style, I pre-ordered it right away. Justina Blakeney has built an awesome career around her bohemian sensibilities. In the book she makes reference to her multicultural background and love of travel, all which have informed her free-spirited sense of style. The book is packed full of beautiful bohemian homes categorized into six different types of bohemian looks including modern, folksy, romantic, earthy, nomadic, and maximal. And she invites us not to just look at pretty things, but encourages us to put our inspiration into action with an "Adapt an Idea" section for each home. It's a great way to hone your creativity, and you might even come up with some ideas of your own in the process. Justina also sprinkles DIY treats throughout the book, an ode to her craftiness and belief in building a home that represents you. According to design psychology, needs for shelter are basic, but not sufficient for a self-actualized home, one that offers pleasure and beauty. This book reinforces my desire to create a home that's beautiful and pleasurable to me. One I love to spend time in. Here are a few of my favorite looks from the book: Just the other day I posted about my affinity for tassels and pom-poms (see here), and one look at this chandelier certainly shows you why. It's such a show stopper, and EXUDES major bohemian glamour. I love it. Plants, plants, plants. I love how cozy and settled they make a home feel. It's hard to be tense and anxious when you've got bits of nature spread throughout your home. I like how it's presented here with midcentury modern furnishings. It feels so seasoned woman to me. The unabashed combo of colors and patterns here are so fun. Such a mix always seems to work in bohemian styled homes. The styling is not mechanical (like trying to remember what goes with what), rather it's more about being attuned to what colors or patterns "speak" to each other, and creating a vignette based upon that, even if the colors or patterns do not work together in theory. This room feels very glamorous to me, kind of like the owner spends her days at home with her dogs writing music while barefoot and wearing a long flowy dress with a myriad of bangles on her arm. Can you see it? What can I say about this turquoise, Navajo wallpaper. It goes to show you that multicultural style doesn't have to feel moody and woodsy, it can be bright and pretty too. I've always wanted a dressing area that was bursting at the seams with beautiful clothing and accessories. This little dressing room makes me want to just dig in and see what treasures I can find. I really like big luscious plants like this, and the brass table lamp and mural gives such an East village vibe. I bet the person who lives here is down to earth, and all around cool--wouldn't you agree? This bedroom oozes with confidence and creativity. It's so bright with thoughtful details like the painting in place of a headboard, and pretty clothes displayed for all to see. I like the use of non-traditional window coverings, And that light! It has so much dramatic flair. So what do you think of bohemian style? Do you see yourself incorporating any ideas from these homes into your space? If you'd like to see more of the book, you can get it here. I'm very excited to announce the formation of my new creative consulting and wellness company, Truly, LLC. It's where I provide wardrobe and interior consulting, conduct related workshops for organizations and companies, and of course, write this blog. And oh boy! has it been a long process to get to this point. Let me explain. As you may know by reading my sidebar or About page, I have a doctoral degree in counseling psychology, and getting that degree was in itself a process. You see, I tried several years to get into a doctoral program before I was accepted into one. Why didn't I get in? I really don't know. There could be many reasons— too nervous in the interviews, lack of clarity, or maybe it just wasn't God's timing. With each rejection I was demoralized but also driven to try harder the next time. People kept telling me to stop trying, but I just couldn't stand the thought of looking back and wishing I hadn't quit. I was driven by a pure desire to succeed and to prove I could do it. And I did. But if you had asked me at the time what I wanted to do with my degree, I may have mumbled something about working with adolescent girls. And while this was (and still is) true, I hadn't fully realized what my career would look like. I hadn't yet considered that a doctoral degree doesn't = a career. Fast forward to my first exposure to blogs. I believe the Paris Apartment was the first blog that captivated me. I was so enthralled with all that beauty captured through graphic design and photographs. Reading blogs became a favorite pastime— a way for me to indulge in my love for fashion and design without being a part of the fashion and design world. I had already decided in college that I would choose psychology over a creative career. And I certainly wasn't going to leave psychology after all the hard work I poured into it. I didn't know I could change, or choose both. I actually got the idea to start Truly 10 years ago, but it didn't come to me in the form of a blog (I didn't know much about blogs then) or creative consulting. It was the name of my clothing store. I always thought I would open up a store, but never knew how that would fit into my plan to be a psychologist. It took lots of jobs, and a lot experiences— the good, the bad, and the ugly, to figure out that I could make my career what I wanted. That I didn't have to follow the rules. That God gives us passions to clue us in on our destiny. Eventually I began to reimagine Truly as more than just a store. I realized that I could use my psychological training to inform my passion for fashion and design, and perhaps set myself apart from other psychologists in a fresh, nontraditional kind of way. So I started a blog. And I began reading and studying the psychology of fashion and design. I even did a short stint as a personal stylist for Anthropologie to learn more about retail. Through the entire process, I started feeling more like myself and not some version of who I think I'm "supposed" to be. What is wardrobe consulting? Wardrobe consulting addresses a person's emotional issues as it relates to clothing. Clients who have concerns about their dress work with me, the consultant, to improve their wardrobe behaviors (i.e., anything from shopping to storing clothes, to creating outfits) and use it to facilitate emotional growth. What's the difference between a wardrobe consultant and a stylist? A stylist focuses on a person's external image only, whereas a wardrobe consultant goes a little deeper to address the impact that self-perception, self-esteem, and other emotional issues have on a person's external image. What is interior consulting? Interior consulting uses principles of psychology and interior design techniques to create spaces for clients that trigger high positive associations. I, the consultant, use a number of assessment tools, including a detailed interview to help clients envision their ideal space. The results of these assessments are used to guide the design of the space. Is consultation therapy? No. consultation is not therapy, although it may be therapeutic. With wardrobe consultation in particular, I only address emotional issues as it relates to clothing, and if any serious emotional difficulties arise, clients are advised to address it in therapy. What type of workshops do you offer? I call them wellness workshops, and I speak on a number of topics including design psychology, fashion psychology, self-esteem, and other topics that encourage a healthy and purpose-filled lifestyle. Have you started offering services? Wardrobe consultation is being offered in a limited capacity, and workshops are being scheduled now. Interior consultation will be offered after fall 2015. I'll be sure to update my readers on the status of my services. Do you have a website? My website is not up yet, but my readers will certainly be the first to know when it is. I hope this answers some of your questions. And feel free to share any other questions or comments you may have. I'm thrilled to share this news with you and hope you will be inspired as embark upon this challenging but exciting new phase of my career. When I was in college anxiously preparing for a for a big presentation, my roommate told me I'd be more likely to do well if I dressed up. While I wasn't sure if it would work, I put on my best slimming knee length skirt, and packed on loads of pearls (it was the late 90's). I can still see myself in class that day--definitely, anxious, but also dolled up and feeling pretty dapper. I got an A on my presentation, and at the time, I didn't think it had anything to do with my appearance, but now I'm not so sure. You may have heard me talk about fashion psychology, and only a handful of psychologist have begun to explore the psychological impact of clothing. One of them is Karen Pine, developmental psychologist and Professor of Fashion. This past week I had the opportunity to read her book, Mind What You Wear, and it is full of research (including her own) that speaks to the power clothing has on us. Here are some highlights from the book. 1. Fashion isn't just visual, it's psychological. What we wear impacts not only others but us, the wearer--and the impact is complex. It isn't rocket science to figure out that we choose clothes based upon how we're feeling. But our clothes sends a message to others who react to us based upon our clothing choices, which in turn further impacts how we feel about ourselves in the clothes. If I decide to wear an unusually revealing get-up, I'll probably get lots of stares and unflattering attention. This would certainly have an impact on me that either reinforces what I was already feeling (e.g., a desire for attention) or stirs up feelings (e.g., shame, embarrassment). 2. The effects of clothing on our mood is often unconscious. Do you notice that you have a little more pep in your step when you wear that tea length skirt, those sequin wide leg pants, or that cute matching top and skirt? 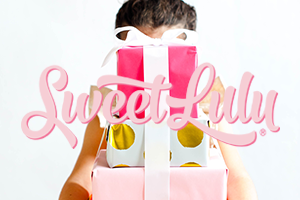 (okay, yes these are all things I'm wanting now) But think of those lucky socks you may have or the piece of jewelry you wore on your wedding day, or other special occasion. Sometimes we form an emotional bond to our things that is so strong, they almost have a magical influence over us when we were them. 3. Clothing can change our character. It's been said that the effects of clothing runs so deep it can cause us to act in uncharacteristic ways. Think of how you feel when you're made to put on a hospital gown or some kind of uniform? Famed researcher, Zimbardo (the one who conducted the famous Stanford prison experiment) showed that subjects who were asked to wear concealing clothing were more likely to express inhibited, cruel behaviors than those who were not dressed as such. They call it the process of de-individuation, and it's a loss of both self-awareness and responsibility. While there are many other factors that contributed to the subjects' behaviors, the study sheds some light on just how powerful clothes can be. 4. Clothing affects the way we think. Yes, it's true. In fact, research has shown that female subjects made to do math problems in a bikini performed worse than those were not made to wear one. They postulated that the women in bikinis internalized society's objectification of women which made it difficult for them to concentrate. In other words, their self-objectification used up their mental resources. This concept has also been known as enclothed cognition, and means that both the experience of wearing clothes and its symbolic meaning affects our thinking. So the next time you choose an outfit, make sure you're comfortable in it, otherwise it can use up the mental energy you would use for other things. 4. Clothing can keep you stuck in a rut or get you out of one. In an attempt to get people out of a fashion rut, Professor Pine co-founded Do Something Different, a psychology based program that encourages people to make small, yet meaningful changes in their look. People are asked to try a "Do" each day for several days, like "Do dress to impress today, "Do try a new color combo today," or "Do stand out today." I love this idea, and it seems to have really made a significant impact in people's lives. *Top 2 Images by Truly blog.